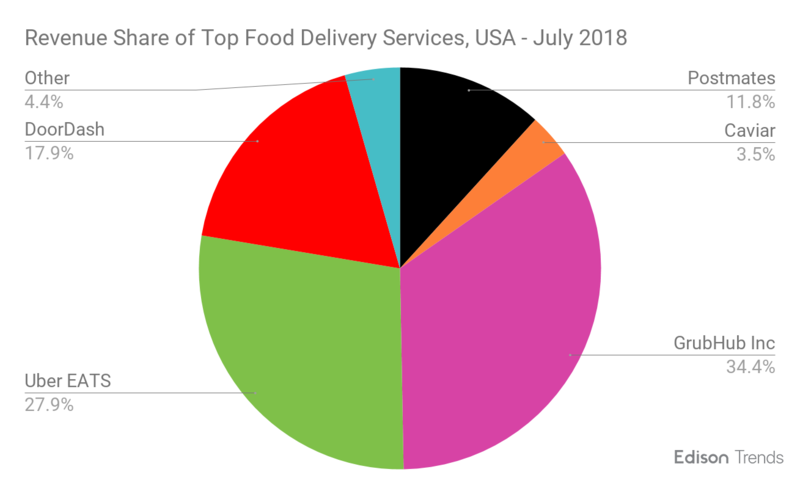 Which food delivery service has the most market share across the USA in 2018? Nationally, in July, GrubHub led food delivery competitors across the USA with 34% market share, followed by Uber Eats with 28% and DoorDash with 18%. Figure 1a. 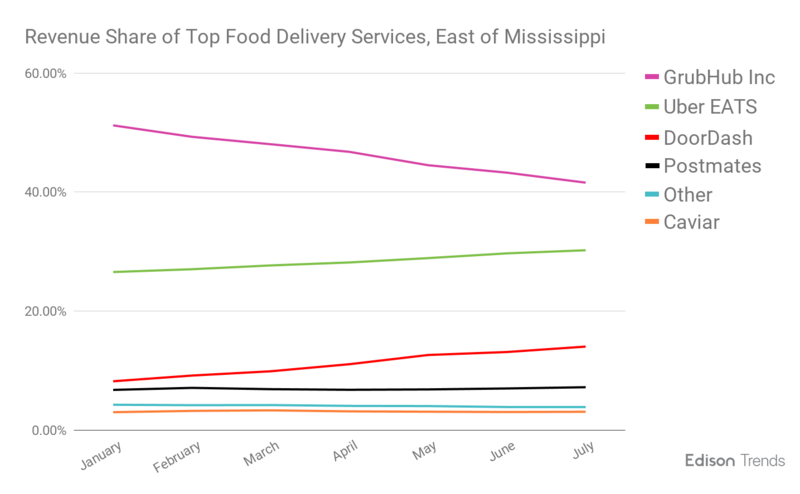 Food delivery services’ July revenue market share, across the USA, according to Edison Trends. 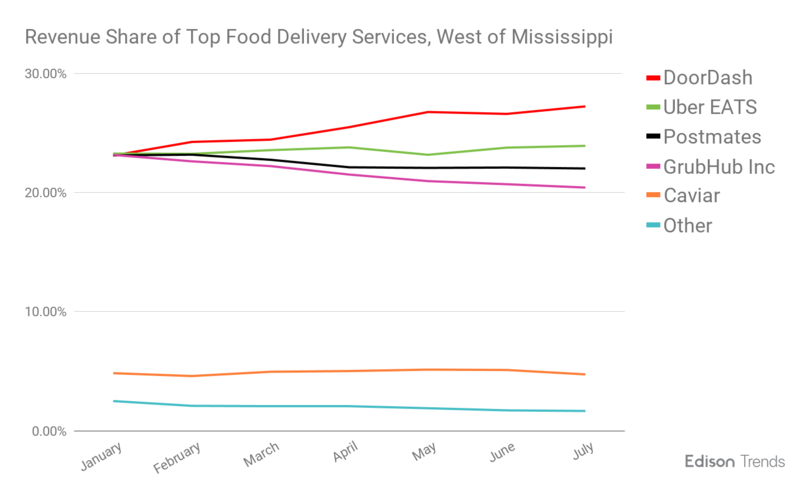 In the first seven months of 2018, GrubHub had the highest (42%) in states east of the Mississippi River, while DoorDash saw the highest amount of market share (27%) in states west of the Mississippi River. Figure 1b. Food delivery services’ estimated monthly share of revenue from January 1 to July 31, 2018 across the USA, according to Edison Trends. 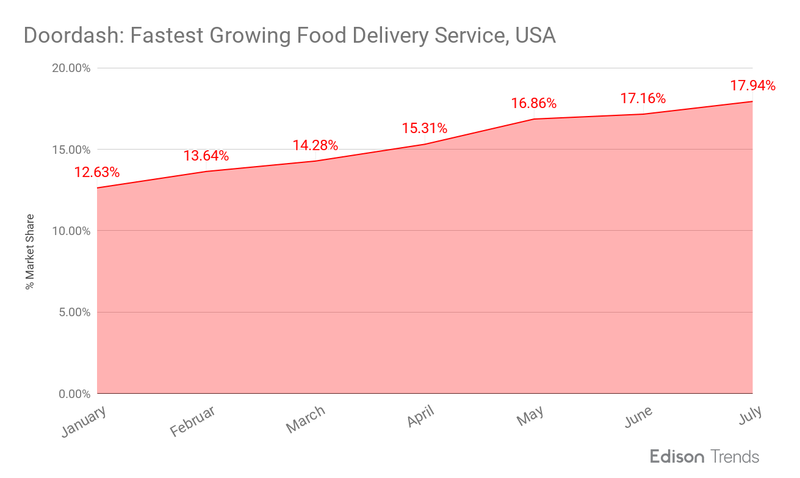 Which food delivery service is growing the fastest across the USA in 2018? On-demand restaurant delivery platform DoorDash is this year’s fastest growing food delivery service in the USA. Between January and July, DoorDash generated 42% growth in share of revenue, the highest gain compared to its competitors; Uber Eats (11%), Postmates (1%), Caviar (1%), and GrubHub (-17%). Figure 2a. DoorDash’s estimated monthly share of revenue, from January 1 to July 31, 2018 across the USA, according to Edison Trends. Additionally, DoorDash’s monthly share of food delivery revenue in the United States grew 5 percentage points between January and July 2018, from 13% to 18%. In comparison, Uber Eats’ monthly share of revenue grew 3 percentage points in the same time period, from 25% to 28%. Postmates and Caviar remained roughly the same, however GrubHub experienced a 8 percentage point loss in market share during this period, falling from 42% in January to 34% in July. Figure 2b. 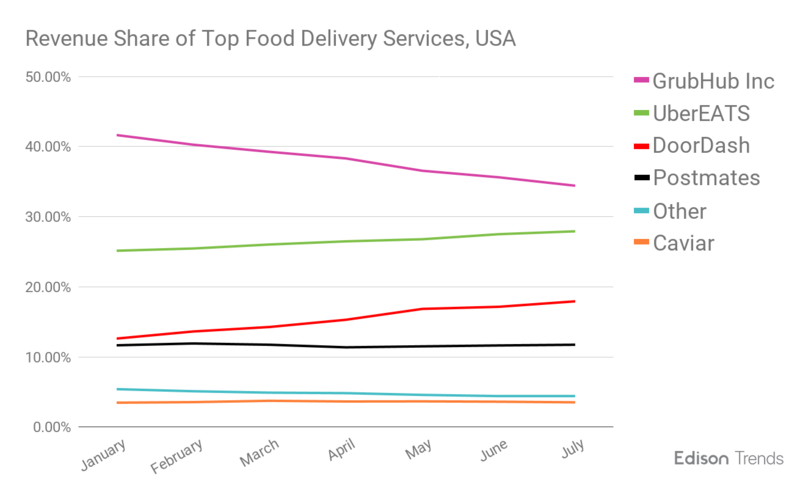 Food delivery services monthly share of revenue, from January 1 to July 31, 2018 across the USA, according to Edison Trends. *The data shown is based on a sample of anonymized and aggregated e-receipts from more than 3 million consumers in the United States.